The Christian Education Network of the ELCA recently featured David Anderson in their monthly E-news. Hi, I am David W. Anderson, a recently retired pastor of the ELCA. Over the years I have been a parish pastor, a college and seminary instructor, adult Christian education editor at Augsburg Fortress, and writer, editor, speaker, and congregational trainer and coach at Vibrant Faith Ministries (formerly The Youth & Family Institute). I have been married to Gloria for over 40 years. Together we have joined Burt and Debbie Streicher to form a resource-driven ministry for lifelong faith formation, Milestones Ministry, LLC. Gloria and I have four children (including a son- and daughter-in-law), and six adorable granddaughters, all living within 15 minutes of us. Can you describe your call to ministry? It is a call that I would never have imagined decades ago. In fact, when my confirmation pastor suggested that I consider being a pastor, I was stupefied and petrified by the idea (My first reaction after shock was to realize how I had fooled him!). My primary role has been as a teacher, especially to youth, families, and congregational staff. Equipping people to nurture the Christian faith in homes and congregations has become my passion. What is the best part of your ministry now? I can’t believe how blessed I have been these past months to sit down with Gloria, read Bible passages, review commentaries, and write and edit weekly Taking Faith Home bulletin inserts with her. Also, working with Debbie and Burt in developing Milestones Ministry and related resources has been such a delight. 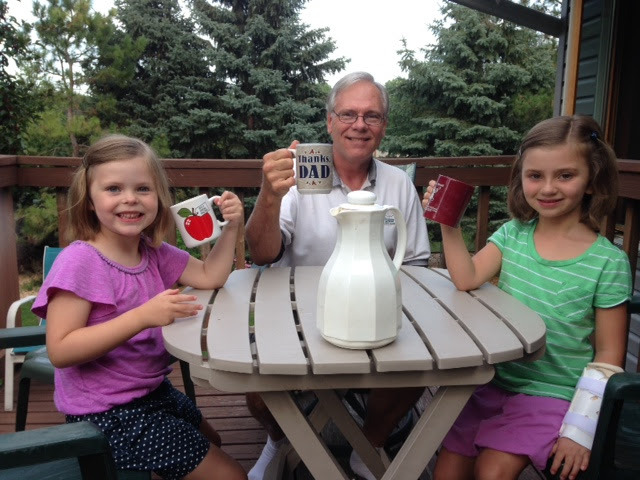 However, nothing beats the ministry of being Grandpa/”Bapa” to six lovely granddaughters. I do believe I am in heaven already! What is one fact about you that would surprise people? Have I mentioned having six granddaughters under the age of six that live within 10 miles of us? I am teaching my granddaughters to say,”No”and “Mine” and to lick the bottom of the ice cream bowl. What are three things Christian educators need to keep their eye on? Christian education is about a life guided by Christ Jesus and not simply learning more about God in Christ. Look for ways to be a “shepherd of souls” to others, that is, help people connect their faith in Christ with daily life experience and deeper longings. Milestones Ministry as a pre- and post-Confirmation faith formation ministry will become the “Sunday School” of the 21st century. I could use prayers for energy and good health to keep up with my granddaughters and Gloria and to keep writing and editing.